Pharmacy Technicians work in pharmacies to fill prescriptions according to a physician’s order. They read prescriptions and prepare medication for dispensing under the direction of a pharmacist. Preparation of the medication includes retrieving the correct dosage form and strength of the drug, counting, pouring, or weighing the medication, and preparing and affixing the prescription label. Pharmacy technicians also assist customers, complete insurance forms, maintain a clean and safe work environment, monitor inventory and order supplies when needed, receive and check orders, and maintain patient profiles. In some pharmacy settings, pharmacy technicians prepare admixture of drugs for IVs. 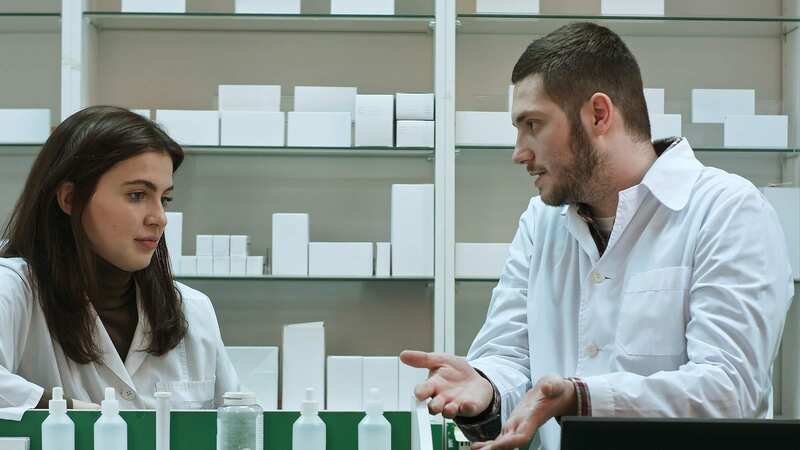 Pharmacy Technicians work in retail pharmacies, hospitals, clinics, home infusion pharmacies, mail order pharmacies, long term care facilities, insurance companies, and pharmaceutical companies. The availability of new drugs on the market, shortage of pharmacists, greater need for drugs among the aging population, and the establishment of national certification for technicians are several factors that increase the demand for pharmacy technicians. New pharmacy technician graduates have the option to pursue pharmacy technician certification by completing a national exam such as the Pharmacy Technician Certification Exam offered by the Pharmacy Technician Certification Board. Wallace State’s pharmacy technician program leads to a Pharmacy Technician Certificate. The school maintains small class sizes, modern facilities, and excellent licensing and job placement rates. The curriculum incorporates knowledge of basic and intermediate pharmacy technology that will enable students to function effectively as a member of the pharmacy team. Graduates may qualify for employment in community pharmacies, hospitals, clinics, mail order pharmacies and other health care settings where they will distribute medications under the direction of a licensed pharmacist. They can also seek national certification, which will give them an advantage when entering the workforce. The American Society of Health-System Pharmacists (ASHP) accredited program requires completion of 27 credits for the Pharmacy Technician Certificate. Instruction will include theory, lab activities, and supervised pharmacy externships. Course topics include Introduction to Pharmacy, Pharmacology I, Computers and Billing, Institutional Pharmacy, Pharmacy Practice, Pharmacology II, Drugs and Health, Clinical Practicum I, and Clinical Practicum II. Students must maintain a minimum grade of 75% or higher to progress through the program. Failure to do so will result in dismissal from the program. Applications must be submitted by June 1 for Fall admission. Incomplete applications will not be considered. The candidate’s GAP will be the deciding factor for selection to the program. Tuition costs $158 per credit. A payment plan is available for eligible students. Calhoun Community College’s pharmacy technician program is a comprehensive 50-hour program that prepares students for employment in a retail or hospital pharmacy. The curriculum will include classroom theory and hands-on lab to support the acquisition of knowledge and technical skills. Areas of study include pharmacology, pharmacy calculations, pharmacy terminology, measurements, dosage calculations, the history of pharmacy, reading and interpreting prescriptions, customer service, and defining drugs by generic and brand names. Other content will include aseptic technique, sterile compounding, I.V. flow rates, dose conversions, inventory control, billing and reimbursement, the top 200 drugs, and handling of sterile products. Students will be expected to complete a pharmacy externship at a local pharmacy. The externship will comprise of 80 hours of supervised practice at a retail pharmacy. The clinical agency may require criminal history and drug clearance before receiving interns. Classes meet Tuesdays and Thursdays from 6:00 pm to 9:30 pm. Tuition costs $999 and includes textbooks and externship. The Pharmacy Technician Assistant program at Lawson State Community College includes the essential preparation adults need to practice in a retail or institutional pharmacy. The program includes a pharmacy externship in various pharmacy settings and theory in the classroom. Students will learn how to interpret, prepare, and label prescriptions, calculate dosages, define their role in the retail and institutional pharmacy, and practice within the legal and ethical requirements for pharmacy technicians. Course topics include Orientation to College, Introduction to Pharmacology, Pharmacy Math and Terminology, Pharmacology I, Pharmacology II, Drugs and Health, Billing and Computers, Institutional Pharmacy, Pharmacy Practice, Pharmacy Technician Practicum I, and Pharmacy Technician Practical II. Students must complete 29 credits to receive a Pharmacy Technician Certificate. The duration of the program is two semesters. Tuition and fees cost $168 per credit hour. Full-time students will pay $1,906 per semester. The Pharmacy Technician program offered by Samford’s Office of Professional Studies and McWhorter School of Pharmacy is designed to be completed in 8 weeks. The online program is taught by experienced faculty from the McWhorter School of Pharmacy and leads to a Pharmacy Technician Certificate – for students who successfully complete the comprehensive final exam. Though the content is delivered online, students will have opportunities to interact face-to-face throughout the program. Students must have access to a computer or tablet, a reliable internet service, and a mobile phone with camera. Graduates will be prepared to sit for the PTCB to become Certified Pharmacy Technicians. Tuition for the program is $899 paid in full. Students also have the option to pay the tuition in two installments of $449.50. The comprehensive pharmacy technician at Jefferson State Community College prepares students for the PTCB exam. The curriculum includes 60 hours of coursework in medical terminology, reading and interpreting prescriptions, defining drugs by generic and brand names, dosage calculations, dose conversions, drug compounding, IV flow rates, billing and reimbursement, and inventory control. Other areas of study include the evolution of pharmacy, the role of the pharmacy technician, pharmacy history, prescription label requirements, review of the hospital and retail pharmacy, children’s doses, generic drugs, patient profiles, dosage forms, aseptic technique, handing of sterile products, and total parental nutrition. A final graded exam will include preparation for the PTCB exam and help students determine their readiness for the exam. Tuition for the program is $899. The payment must be made at registration. Additional costs include textbook and the certification exam fee. Scholarships through the Workforce Investment Act are available for eligible students. The pharmacy technician program at Health Care Connection prepares students for employment in a retail or community pharmacy. The curriculum will include preparation for the national certification exam. Areas of study include medical terminology, reading and interpreting prescriptions, pharmacy operations, IV flow rates, customer service, billing and insurance, pharmacy law and ethics, labeling prescriptions, history of pharmacy, aseptic techniques, role the responsibility of the pharmacy technician, pharmacology, dosage calculations, and inventory management. Students must complete the 72 hours of instruction to obtain the Pharmacy Technician Certificate. Tuition for the program is $790. Jefferson State Community College offers a fully online pharmacy technician program that can be completed in 6 weeks. Students will acquire the skills to obtain entry-level positions in retail or hospital pharmacies. Instruction will include anatomy and physiology, medical terminology, reading prescriptions, common classes of drugs, pharmacy math, dosage calculations, and patient records. Course modules include What is a Pharmacy Technician, Let’s Talk Pharmacology, Understanding Pharmacy Rules and Regulations, A Look Inside a Working Pharmacy, What Do All These Medical Words Mean, Anti-Infectives: The Drugs That Kill The Bugs, Your Core, The Central Nervous System, Hormones, Eyes and Ears, Let’s Do a Little Math, Communication, and Future of Pharmacy Technicians. Students must take the final exam to complete the course. Tuition for the program is $115.